Next Article MUSINGS Who ate all the pies this Valentine’s? BY THE BOOK Seamus Duffy in The Bookshop on Bridge Street, Westport. THE Roman orator and statesman Cicero summed it up a long time ago: “A room without books is like a body without a soul.” Admittedly, the world has changed significantly since those turbulent decades before the birth of Christ, when stone tablets were used as reading instruments. But books, hard ones and soft ones, fly-leafed and dog-eared, fiction and fact, fantasy and farce, remain central to our social and cultural lives. They create a web between reality and the imagination, the past, the present and even the future. So you could say that Louisburgh native Seamus Duffy is lucky. He lives with books every day of his working life and tells The Mayo News that even after 20 years of running his shop on Bridge Street, Westport, he still opens a newly delivered box of different titles with all the curiosity and wonder of a child. Seamus grew up, along with his six siblings, above the family’s small shop on Chapel Street in the west Mayo village. His late mother, Mary, sold just about everything in their busy store, from groceries to drapery for men and women. “From once we were seven years old, we worked in the shop, which back in those days was opened from 9am to 11 o’clock at night. All the customers were your friends and family with big business from Inishturk, Clare Island and beyond the parish, out towards Leenane. There were no credit cards in those days, so people either paid by cash or were put in ‘on the book’ and paid after they had sold cattle or sheep at the regular fairs or markets,” explains Seamus Duffy. He believes that his love of meeting and dealing with people comes from this early childhood experience. 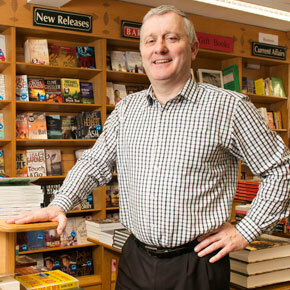 However, Seamus ultimately took a circuitous route to opening his bookshop back in 1993, first working in manufacturing in Roscrea, County Tipperary. “When I was working in Roscrea back in the early ’90s, I noticed there was a trend for production to be moved to the Far East to cheap labour companies. So since my father had a premises on Bridge Street in Westport – where the hairdressers, Style Council was – I decided to try my hand at the retail business. Entering the retail sector proved to be a big learning curve for Seamus, but he savoured every moment of trawling through the catalogues and the lists of bestsellers. Strikingly, just like over this Christmas, when he opened back in 1993, both John Grisham and the late Maeve Binchy were among the most popular authors. Of course, Seamus Duffy is all too aware that other trends in the book business are fast-changing. Just like with record shops, revolutionary developments in digital technology mean that more and more people are now downloading their favourite authors onto ebooks or tablets (clearly not the type used in pre-Christian times by Cicero and his scholarly pals). “Younger people are growing up with computers and iPads and they use them for so many aspects of their education and social lives. For example, my 13-year-old daughter never uses a dictionary, instead she uses word-check on her computer. But, there are still an awful lot of children buying books and, if anything, children’s books have improved greatly in their quality, art work and value,” Seamus observes. While he believes that bookshops will have to diversify in the near future – sell coffee or more stationery or magazines as well – they will survive. Moreover, the popularity of book clubs – there are up to 20 in the Westport and Louisburgh areas – has provided a boost to sales in recent years. Praising both his staff and family for their support, Seamus Duffy stresses that the success of his bookshop is also due to the progressive approach to tourism in Westport. While many other tourist towns effectively close down over the winter months, Westport hoteliers and providers offer such ‘brilliant deals’ that business continues right through the low-season.